You are at:Home»Tech Article»Should Apple Have Stuck With Google Maps? Appleâ€™s public apology over the problems experienced with its Apple Maps app has led to suggestions that the company should have kept their relationship with Google Maps. The launch of the native Apple app with iOS 6 was intended to draw Apple customers away from a rival service, but has been hit with multiple bugs on its release, leading to criticisms over the belief that Apple Maps could compete on the same level as its more experienced counterpart. 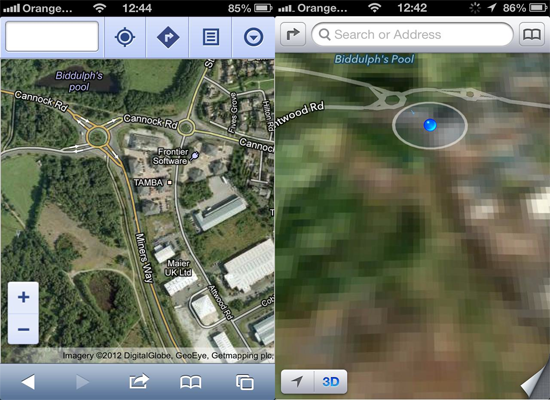 However, is the problem really that serious, and what positives can be drawn from Apple Maps? In some respects, sticking with Google Maps as the default option for smartphones and tablets would have made more sense in the short-term for Apple. Google Maps is well established, and represents a reliable and trusted brand. Unless Apple Maps was going to be exceptional out of the gate, it was always going to be open to criticism. Appleâ€™s own hyping of the app, then, proved difficult when the new app featured missing locations, and numerous bugs that have been gleefully showcased by competitors. Indeed, Appleâ€™s climb-down has included recommending rival apps, including Google Maps, while they try to improve Apple Maps. However, itâ€™s important to remember that Apple Maps is still in development, and shouldnâ€™t be viewed as the final version of the app. The early problems suffered by the app is perhaps more due to the pressure of delivering on the hype, which is always an issue for a new Apple product. While other options are available for iOS 6, the fact remains that Apple Maps isnâ€™t going away any time soon. Indeed, the app is being constantly updated to fix bugs, and will only improve in the future. There are also a number of features on Apple Maps that make it an excellent choice. Primarily, Apple Maps is much sleeker in its basic design than Google Maps. Apple Maps uses vector mapping, which reduces lag time when moving, and has an arguably superior 3D layout. Business mobile users can particularly benefit from multi route planning, and rapid rerouting. In terms of navigation, Apple Maps also loads quicker, doesnâ€™t take up as much download space, and can be activated by voice commands in your car. Anyone in a rush to a meeting, or wanting to work out the most efficient route for expenses, can probably opt for Apple Maps as the better choice. Throw in automatic offline use, and Apple Maps has a lot going for it. The future of Apple Maps is consequently one where its popularity will increase as the bugs get resolved from early versions. The main benefit for Apple users will be an app that is designed to be compatible with iOSâ€™s strengths, in the sense of being quicker, using less power, and featuring an excellent level of design compared to other systems. Early reports from areas where bugs have been fixed, which include San Francisco, indicate that Apple Maps provides much more comprehensive routing and a better looking set of maps than Google. Once the app catches up to its problems, then it should therefore be a great alternative option to Google Maps and other navigation apps. Rob James is self employed and recommends having a 4G business mobile.Â Rob uses internet marketing to promote himself, and recommend you optimise your site for mobiles too.Â He can usually be found blogging about mobile related topics, and loves checking out the latest gadgets. OnePlus 5 Review: Is This The Best Android Smartphone Out Now?